Donald Trump might be busy trying to figure all the details out of his move to the White House, but apparently, he still has the time to meet during his busy day with business partners. 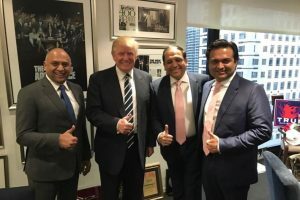 Last week Trump had a meeting with three businessmen from India. The three are building a new apartment complex that will have the president-elects name. This raised new questions about whether Trump can separate his business interests once he becomes the U.S. president. The Trump meeting was reported early last week by a newspaper in India, which said the three India businessmen discussed the expanding of business interests of Trump in India. Currently Trump’s company has five ongoing projects in India. He allegedly praised the prime minister of India during that meeting. He is reported to have said that Narendra Modi the prime minister was doing an excellent job. On Sunday, this story was run by the New York Times that noted the meeting raised new concerns about the conflict of interest on Trump’s part, once he is the president. A Trump spokesperson played the significance of last week’s meeting down, emphasizing that it was only a courtesy call from those people who were wanting to give their congratulations to Trump for being elected president. Ethics experts quickly sounded an alarm. One expert said there might be some who look at the meeting as ok, but for most of the public in the U.S., it will not be ok. His president-elect role should dictate that there is someone else handling the business matters. All this comes following other news that has raised questions if Trump can maintain business interests apart from his commander in chief role. Earlier Ivanka Trump was present at a meeting with Shinzo Abe the Prime Minister of Japan. That concerned many since she is one of the children of Trump who will operate a blind trust that would be operating his businesses while he is president of the U.S. In addition, on Saturday it was revealed by the Washington Post that the Washington hotel owned by Trump was attempting to woo embassies into putting visitors at that property when they visit the capital. Time will tell what other items pop up to give people concerns over Trump’s business concerns and his running the nation.